There is a Dirty Little Secret that exists in your home. – it’s being hidden by mattress covers and sheets. Allergens (dust-mites, pet dander, and pollen), bed-bugs, bodily fluids, stains and smells are an ongoing nightmare. Rest Assured, there is a solution that eliminates stains and 99.8% of contaminants that are coming between you and a good night’s sleep. 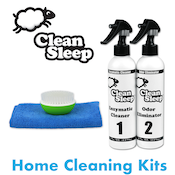 In as little as 15 minutes, Clean Sleep sanitizes mattresses and furnishings, without harmful chemicals, allowing you and your family to rest easy. When you contact Clean Sleep for your mattress cleaning, we’ll lead you through a very professional, straightforward process. We come to you so all you have to do is call us and be home to lead us to your mattress. Each mattress takes approximately 15 minutes to clean, and we do all the heavy lifting. All we ask is that you remove all your linens and clear a path through your door. Sit back and relax while we remove stains, odors, dust mites, and (in the most extreme cases) bed bugs from your mattress. We bring your mattress back to your room stain-free, smelling and feeling like new. Once your appointment is scheduled, we come to your home to clean and sanitize your mattress. We will call you within an hour of your appointment to let you know we’re en route. Leave the heavy lifting to us! We make our service as convenient as possible. We ask that you remove all linens as well as clear a path through your door. From there, we handle the rest and return your mattress in like-new shape in approximately 15 minutes. Your mattress will be stain, odor, and pest free. Rest assured, you’ll be sleeping better than ever.